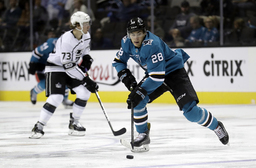 Anze Kopitar had two goals, Dustin Brown and Nick Shore also scored and the Los Angeles Kings beat the San Jose Sharks 4-1 on Saturday night. The teams traded goals in the first 6:14 of the contest. Brown took a pass from Kopitar and flipped a shot off Jones' left shoulder pads and into the net. Boedker redirected a shot by Brenden Dillon in front of the net to get it past Quick. The goal was set up by Jannik Hansen's steal near the net. Hansen got it out to Dylan DeMelo to start the scoring sequence. It was all Los Angeles afterward. Kopitar scored with eight seconds left in the first period after Drew Doughtyknocked down a lazy clearing pass and got the puck to Jake Muzzin. Kopitar took the pass and sailed the puck low, beating Jones to the stick side. Kopitar scored again midway through the second period, this time shooting over Jones' right shoulder and into the net. The Kings added an own goal, credited to Shore. Jones came out to challenge a shot but was unable to control the puck. Shore got it and sent a slow shot toward the net. Melker Karlsson tried the clear the puck but sent it into the net instead. NOTES: Neither team has swept a season series in the rivalry. ... Sharks C Joe Thornton has 75 career points against the Kings. ... Shore is the only player to record a point in the Kings' first two games. Kings: Host the Calgary Flames on Wednesday. Sharks: Host the Buffalo Sabres on Thursday.